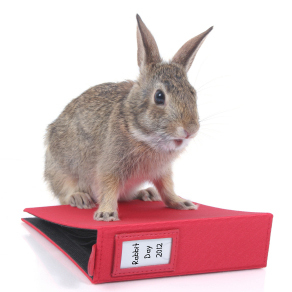 International Rabbit Day 2014 Is Coming! I first learned about International Rabbit Day a few years ago. Someone sent me a link to the website Holiday Insights with information about how the day started and the intent to promote the well-being of rabbits. It is usually set for the Fourth Saturday or Sunday in September. Holiday Insights has the date listed for Saturday this year which would be the 27th. I see that House Rabbit Society is planning on Sunday the 28th for observing International Rabbit Day. I say why not make it an International Rabbit Weekend and focus some attention on our big eared friends for both days. Here is one suggestion for observing the day/s: “Celebrate this special day with your pet rabbit. Learn a little more about him and how to properly care for his needs. If you don’t have a pet, maybe today is the day to get a pet rabbit! ” Visit the Holiday Insights page for more information on the meaning and origin of International Rabbit Day. Until last year, I didn’t know that anyone had designated a day to think about rabbits other than the obvious, Easter, which can be a very bad day for live rabbits who go to homes unprepared for their daily longterm care. Then someone sent me a link to the website Holiday Insights with information about how the day started and the intent to promote the well-being of rabbits. It is usually set for the Fourth Saturday in September which would be the 22nd this year. Here is one suggestion for the day: “Celebrate this special day with your pet rabbit. Learn a little more about him and how to properly care for his needs. If you don’t have a pet, maybe today is the day to get a pet rabbit! ” Visit the Holiday Insights page for more information on the meaning and origin of International Rabbit Day. The Etsy Rabbits team is planning to get the word out that the day exists by creating treasuries (Etsy member curated showcases) during September showcasing rabbit themes, items and the shops of Etsy Rabbits team members. There are currently over 300 members of the team from countries around the world. Most have shops on Etsy, but those who have buyer accounts on Etsy are welcome to join too. If you love to buy or create bunny rabbit themed items or items for rabbits, check out the team. Members of the team love living rabbits and many members have one or more big eared friends at home. Some members are actively involved with assisting rabbit rescue groups. I will post some links to treasuries soon as more get going creating them and will be creating some treasuries myself. Here is a lovely prelude to the fresh clean whites of winter in beautiful woodland themes. Just a reminder that International Rabbit Day is a week away. It is set for the Fourth Saturday in September which would be the 24th this year. *Note: Some pick the fourth Sunday to celebrate. Click here to go to Holiday Insights for more information on the meaning and origin International Rabbit Day. The Etsy Rabbits team is celebrating all of September through Sunday the 25th, the day Etsy chose to celebrate International Rabbit Day. Check out the Etsy Rabbits team blog for the growing list of treasuries of great handmade rabbit items on Etsy, including items by team members. There are items that are rabbit themed and things on Etsy for your rabbit too. This treasury is part of a Nonteam Challenge that runs each week from noon on Thursday until noon on Sunday. Everyone creating a treasury must build it around one challenge item. This week it is The Reading Tree by Emerald Town Raven photo in the top. Looking at Emerald Town Raven’s shop, I saw some beautiful photos of cats. I was thinking about the length of time for the challenge, 72 hours. The idea of cats, the mystery of them and 72 hours combined together into a who done it mystery show feel for me and I went looking for items that would go along with that. I loved using the muscadine grape-vine chews from Magic Happens Rabbit Rescue. It looked like a group of potential evidence with its “B” crime scene label marker in place. All in all, this was a lot of fun to create. Okay, so yesterday I said today I would have a bit of a surprise. Surprise, I goofed when I created this yesterday and it was released on Etsy from the wrong user account instead of Rabbittude as I had intended. Then I almost forgot to post it today. So, doubly embarrassed rabbit here. While I was getting this post ready, I was surprised when a leader on the Etsy Rabbits team pointed out that Etsy has the day listed on their dates to remember for September as being, Sunday the 25th. So isn’t that just the way with event planning. Two coordinators check dates with different people or sources and the next thing you know, you have people being notified about two different dates. 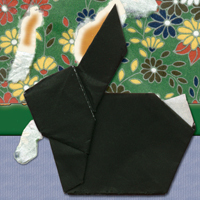 For Etsy we will make it the International Rabbits Day WEEKEND, September 24 – 25th. Whoo Hoo! We will get ready for a two-day party of rabbits bouncing around and into view as much as possible as we treasure the days by creating lots of treasuries to promote the now over 100 shops of the Etsy Rabbits team members. Commence bunny hopping! This will be the first of six treasuries to highlight both International Rabbit Day and the active Etsy Rabbits Team shops. This treasury is items from international team members. The team currently has members from 14 countries and about 100 active shops. Just a reminder that International Rabbit Day is 3 weeks away now. It is set for the Fourth Saturday in September which would be the 24th. Special Note for tomorrow! 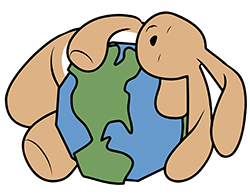 The Etsy Rabbits team will be doing some treasuries this month to let more people know about International Rabbit Day and highlight some of the items and shops on Etsy run by Etsy Rabbit team members. Tomorrow, I will post a treasury that will be all items from Etsy Rabbits team member shops. Will I be posting one with a fall theme, items for rabbits / pets, a colorful treasury or something else? Check back to see. 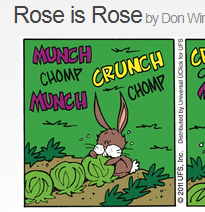 here to enjoy the Rose is Rose comic. Just a reminder that International Rabbit Day is a month away. It is set for the Fourth Saturday in September which would be the 24th this year. 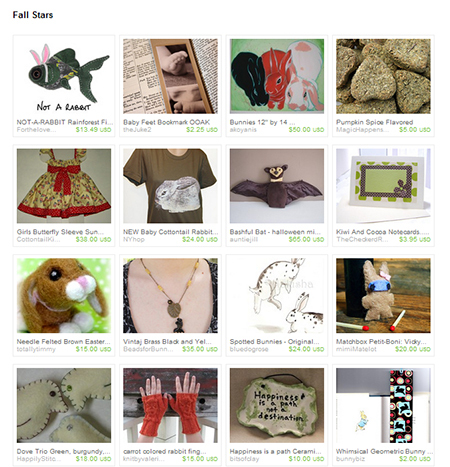 All items in this treasury have been created by members of the Etsy Rabbits team. Visiting the shops of team members, you will often find lots of bunny rabbit themed items. However, there is also a great deal of diversity too, something for everyone. The thing that unites members in joining the team is a love of bunny rabbits. Many but not all team members have house rabbits. There are currently 126 members on the team, both buying and selling Etsy members. Go bunnies! I didn’t know that anyone had designated a day for rabbits until someone sent me a link. It is set for the Fourth Saturday in September which would be the 24th this year.